Two weeks ago I woke in the middle of the night, my chest ablaze with an unprecedented heartburn that no quantity of medications could extinguish. In the morning a trusted medical professional told me that stomach acid had likely scorched my esophagus and I'd just have to wait until it healed itself for the pain to stop. Besides being forced to subsist on chicken broth in the middle of a heat wave, this meant that I'd end up trashing the substantial container of papaya salad I'd made the night before. This summer I've gotten into the habit of making som tam, maniacally pounding garlic, chiles, dried shrimp, peanuts, palm sugar, long beans, and shredded green papaya in a terra cotta mortar and dosing it with liberal splashes of fish sauce and freshly squeezed lime juice. It's been therapeutic, but with each successive batch I'd begin by pulverizing increasing numbers of chiles until I'd arrived at the nuclear salad that laid me low. I normally have no problems digesting incendiary food, but I'd been particularly emboldened by an interview I conducted last month with Thai celebrity Chef McDang, author of The Principles of Thai Cookery. "There's nothing delicate about Thai cuisine, OK?" he told me. "It hits you like a ten-ton truck. Everything is strong. Pronounced tastes: very salty, very sweet, very sour, very hot. You cannot expect Thai food to be like French cuisine." 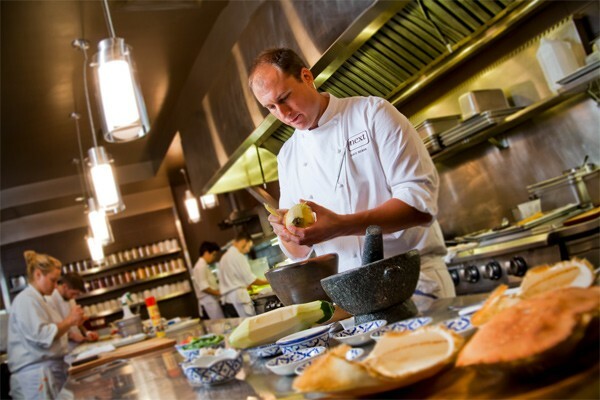 A week later the pain was gone as I stood in the kitchen at Next watching executive chef Dave Beran preparing that same iconic Thai salad, the third course in my particular Tour of Thailand, the second incarnation of Grant Achatz and Nick Kokonas's ever adaptive restaurant. As when I reviewed Paris 1906, the chef and front of the house were well aware I was visiting for work. That's not a typical or ideal state of affairs for a restaurant critic, but it's also why I was offered the demo, normally reserved for the kitchen table. I wasn't about to say no. Beran pounded his garlic, chiles, and sugar into a smooth paste in less than a minute with mesmerizing dexterity and grace before adding peanuts, fish sauce, and lime juice. He deftly julienned green mango and papaya using the same treacherous crosshatching technique McDang and thousands of Bangkok street vendors employ, before tossing and pounding it further, and arranging it in upturned crab shells. Back at the table it wasn't nearly as spicy or funky as I normally prefer—for instance, he'd added fresh salted blue crabmeat instead of dried shrimp or unshelled pickled crabs. But given the multi-textured, irregular results of his knife work, in at least in one important regard I'll bet his version is closer to a Bangkok street vendor's than any other Thai joint in town. It gave me no pain, but he'd achieved something I've never been able to: a perfect balance of salty, sweet, sour, and hot—more like a Porsche than a ten-ton truck. But that's why he's Dave Beran and I'm just a keyboard monkey. And it just goes to show that if any kitchen is capable of taking on the fundamentals of an entirely new cuisine in one month, it's probably this one. I'm not entirely comfortable typing that. Currently in Thailand there's an abiding controversy regarding certain foreign chefs' attempts to assume the mantle of authority on classic Thai cuisine. And here at home there's incessant squeaking among jaundiced foodlums about whether the Next crew is capable of creating anything above and beyond what our best storefront Thai joints do at a fraction of the price. These conversations have no resolution. What I can point out is, given the realities of restaurant operations, it's likely that Next is one of the only places in town making curry paste from scratch. I can also tell you that, against the odds, the restaurant found a reliable supply of usually scarce but essential cilantro roots to pound into those pastes—Next is probably the only restaurant in town with those. On the other hand, if you were lucky enough to win tickets (if not, there are same-day seatings announced on Facebook) you can see for yourself the droplets of chile oil that float on the surface of the kitchen's interpretation of Panang curry, a cosmetic but still relatively bold refusal to capitulate to the typical emulsified Western presentation. And while the servers may speak with presumed authority about the antiquity of the late-course dish of catfish with celery in a thin caramel sauce—I'm fairly certain that Thais of yore weren't using immersion circulators to achieve the silkiness of Next's fillets. Regarding dishes such as those, it's telling that some of the Thai-language menu descriptions match the descriptive English ones: it's not "Panang curry" but "beef cheek, curry, peanut, nutmeg, kaffir lime." Maybe that's because the dish is sprinkled with nutmeg, an ingredient not uncommon to beef dishes, but usually not common to that one. Incidentally, that course, served family style, is built around a beautiful, meltingly rich piece of meat jelly, and it is analogous to the lamb course of the Paris menu—the late-meal constitution killer, so rich it might force you to abdicate the final dishes if you aren't careful. It takes you by surprise, considering that Tour of Thailand begins with a selection of dainty street food bites constructed and garnished with Alinea-like precision but served on newsprint, with plastic utensils and pink paper napkins: a slice of fermented Issan-style sausage topped with galangal, chile, and peanut relish; a crispy, salty prawn cracker; a sugar-glazed roasted banana; a bite of sweet raw shrimp with garlic. A steamed Chinese-style bun too doughy and dry to complement the meaty green-curry-flavored mushrooms inside is the only dud in the bunch. These are paired with a refreshing batavia arrack cocktail, sweetened by guava, mango, and papaya juice and poured into a clear plastic disposable cup, initiating a surprisingly varied series of beverage pairings that include cocktails, white and reds, and a limited-edition hibiscus and mangosteen ale from Half Acre that couldn't be more in tune with the current mania for fruity sour beers. After a few small grilled, skewered bites and the papaya salad, the street food conceit is swept away, replaced by a cloth table setting colored to correspond with deities and planets associated with whatever day of the week you happen to be touring. What follows is a series of surprisingly straightforward renditions of familiar dishes. Liberties are taken for sure, the presentations from the easygoing servers are always playful and entertaining, the ingredients are top tier, and the flavors are mostly as balanced as the som tam. But there are few ten-ton trucks driving into the dining room. A bowl of pad thai appears with surprisingly slippery noodles, a refined version garnished with snappy, fragrant water spinach. The "hot and sour broth" is instantly recognizable as tom yam and poured over phenomenally crispy and fatty bits of pork belly, button mushrooms, and a transparently thin tomato slice. Yet the expected fish sauce funk seems dampened in the context of the lustrous fat-finished broth Beran says was inspired by the ramen at Ippudo in New York's East Village. The later catfish and curry courses? Delicious, but relatively restrained. The biggest exception to this—and for me the most enjoyable and novel course—comes in the middle of the tour. Representing the Thai principle of kluk, it is an array of relishes meant to be eaten with jasmine rice, a fork in your left hand and a spoon in your right. It's not something one normally encounters in Western Thai restaurants—if ever—and it represents some of the tour's most pugnacious and enjoyable flavors, particularly the nam prik pao (an unusually smooth, processed version of the sweet-hot, dried-shrimp-based chile jam) and the rich, salted duck egg, green mango, and radish dip that casts egg salad in a whole new light. With these and other relishes—such as a roasted banana pepper and dried anchovy variant, or a pair of brilliant green chile oil and deeply funky fish-and-shrimp-paste sauces that servers refer to as "Ricky Martin" and "James Brown," respectively—this course, which remains on the table for successive ones, customizes the experience to the individual diner's appetite for assertiveness. Given the relative subtlety of some dishes, it's surprising that Beran didn't go for a more manipulated, reimagined approach to the menu. That restraint disappears during dessert, when whole coconuts are brought to the table containing a riotous composition of five sweets including corn pudding, coconut ice, candied lime, licorice tapioca pearls, and sugared egg strands cooked in saffron and star anise syrup that recalls the classic dessert foi tong. This is a jaw-dropping dish, as exciting and delicious as the following is disappointing: a half dragonfruit—a spiny, fuschia, leopard-spotted exotic as inherently bland as it is visually stunning—dressed with rosewater and accompanied by a plump rose for olfactory effect. Following these dishes, the paradigm shifts back to street food, and diners are sent off with plastic baggies filled with milky sweet tea. It's the accumulation of surprises like this that make the Tour of Thailand a successful sophomore menu for Next. The enduring success of the restaurant will always hinge on the kitchen's ability to create a new one that surprises and surpasses most diners' expectations and experiences. With the first menu that was easy—most of us didn't know what to expect. With Thailand the challenge was much greater. Would it be a completely transporting experience the way Paris 1906 was? It's a bit too conservative for that. But beginning with the cool, rice-perfumed breeze that greets you at the door, it is a largely delicious and fun trip, and I pity the purists who won't get on board.